Now that Dreamforce has come and gone, we’re already missing the excitement of the show floor- but not for long! We’re excited to be hitting the road again with Salesforce for their World Tour. Throughout the year, Salesforce brings the energy of Dreamforce to international pop-up shows, educating the world on how to connect with customers in an entirely new way. With access to the best speakers, sessions and keynotes, attendees can learn the best ways to, service, market and succeed, all firsthand from leading customers. The OneMob team will be bringing the power of video messaging to the East Coast, making appearances in New York on November 18 and Atlanta on December 9. To learn more or register for the Salesforce World Tour, read here. It’s round two! 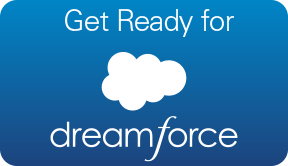 OneMob is proud to be a bronze sponsor of Dreamforce 2015. We had such a great time last year that we had to do it again. The OneMob team will be in full “force” (pun intended) to answer any questions, share latest enhancements, provide best practices and help you make the perfect #SELLfie for Salesforce. We’ll even given you a selfie stick for your efforts, so come visit us in Moscone West – Booth W941.